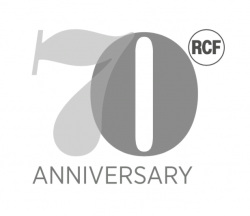 RCF began producing transducers in 1949. And here they are Nearly 70 years later still supplying the world with far superior sounding loudspeaker systems. Let’s start with how it all began, Back in 1949 RCF started by making microphones and loudspeakers. Back in the late 1960s concerts went electric, and numerous loudspeaker pioneers were searching for high powered devices. RCF were quite obviously at the top of their game and were actually one of the first European brands to supply internationally, Experienced gained! There in depth no how in transducers and electronics provided the perfect technological knowhow into making the perfect and precise audio systems, whether it’s a at home hi-fi system to a huge concert sound system RCF’s Passion for perfection drives the design of every product. As we are all aware RCF meets the needs of all musicians, DJ’s, Sound engineers and system integrations. Whatever your audio requirements may be RCF will certainly have the right solution. Radio Cine Forniture better known as RCF take tremendous pride in delivering you with the highest spec and quality sounding speaker. Knowledge in knowing they take great delight in supplying you a Hand crafted loudspeaker, from every component to all nuts and bolts are hand built with great pleasure. In 1980’s the international sale network intensified and the product offers just kept on growing! A range of Car speakers in Carbon fibre was developed. By the 90’s the professional speaker market all began, The RCF brand appeared on the company’s own products rather than just the transducers inside. 1996 soon came round and RCF was a milestone within the market with its ART 300-A it was one of the very first portable, composite material loudspeaker, with a exceptionally outstanding sound quality. RCF are never too far away with a new trick up there sleeve, each year they keep surprising the industry with more products and ideas such as ART series , TT+ range, Digital mixing stations and much more. What a better way to celebrate 70 years of professional audio than with a magnificent price drop in all of RCF ART series speakers. Click the links below.